I love trying different foods from different cultures, different chefs and different ingredients. 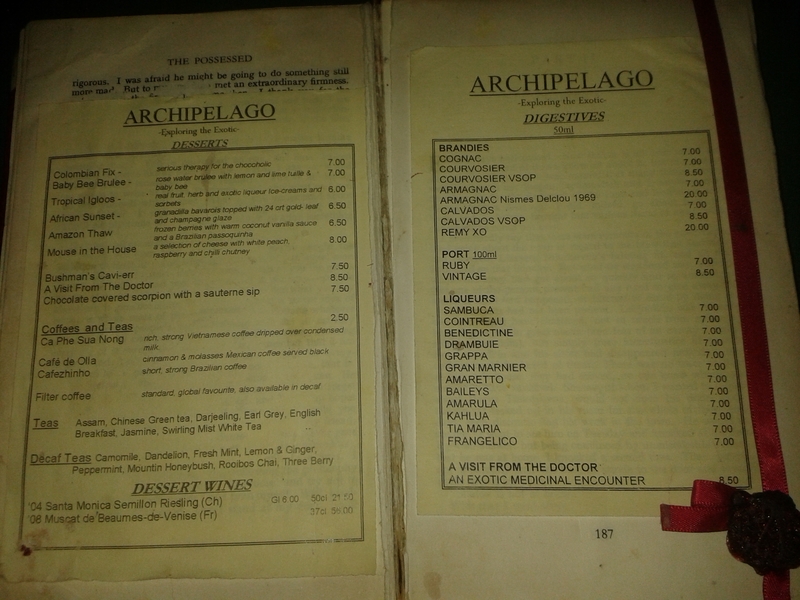 Claire and I decided on exploring Archipelago, which was a very different experience from your usual London restaurant. As you walk in, you feel like you are no longer in London. It has a coziness to it with little treasures and trinkets placed everywhere, which were obviously from the owners’ explorations around the world. 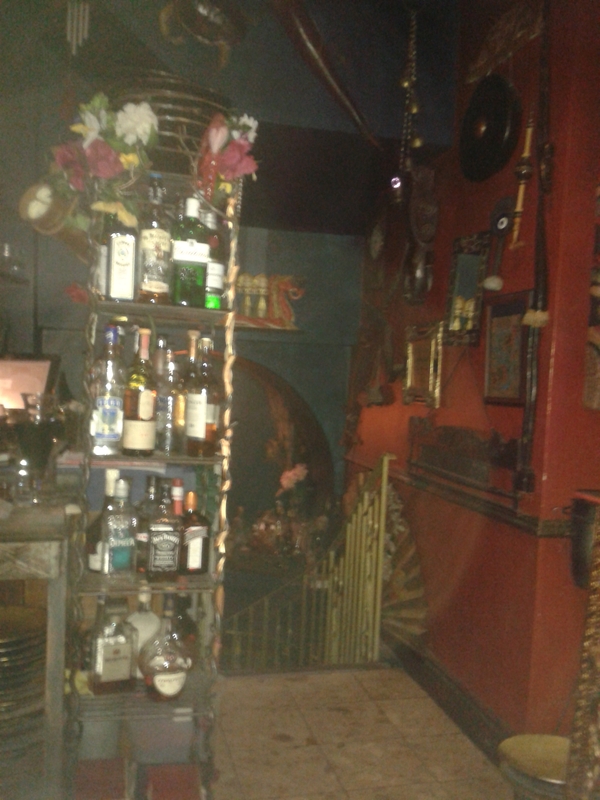 I spotted an eclectic collection of bits from Thai, Indonesian, Egyptian, Moroccan, Australian Aborigine, Indian, Turkish and African cultures as well as peacock feathers and palm trees in every little corner. Claire described the feeling as being much like when you were a little kid and you build a fort and you had created your own little world. 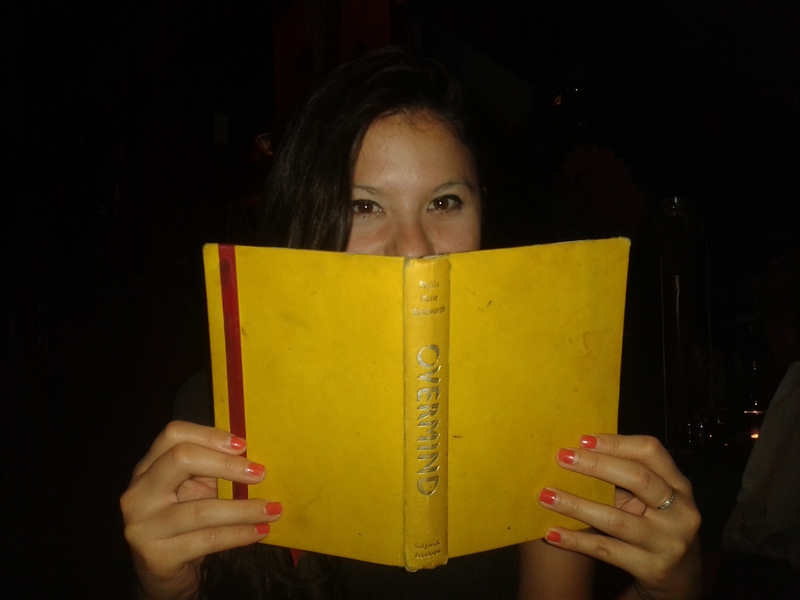 The drinks menu came in a wooden cylinder box with carvings on it. It was rolled up inside and on one side of the paper was a map and the other side were the drinks. The food menus were also rolled up and they were tied with a plastic flower and placed in a little treasure-chest-type box. 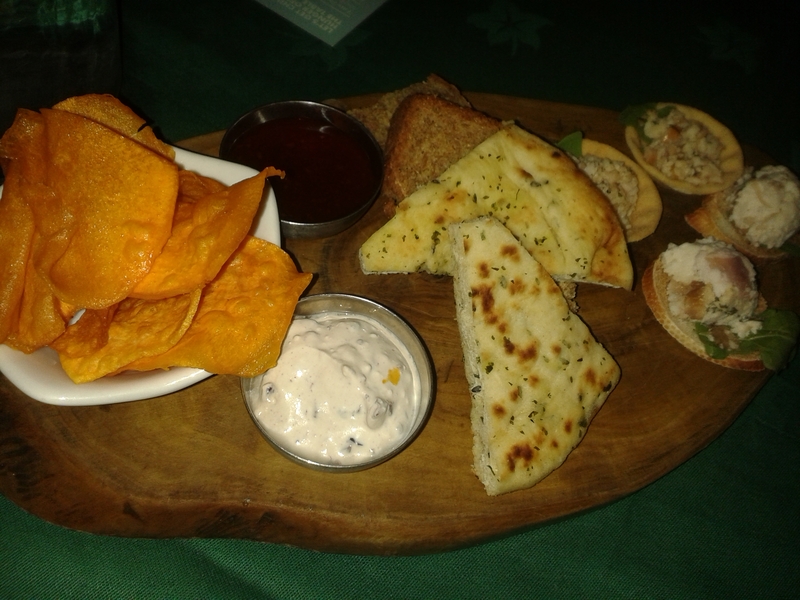 After we ordered our meals, which the waiter was very helpful with to give us an idea of tastes and flavours, we were given a platter of nibbles. This was mixture of mini goat cheese and caramelised onion tartlets, a mini Thai flavoured chicken and mango tartlet, a couple little slices of garlic pitta bread, a couple of dips and mini bowl of sweet potato chips. Before we knew it, we were greeted with our starter of crocodile wrapped in vine leaves with sweet plum sauce, which we shared. 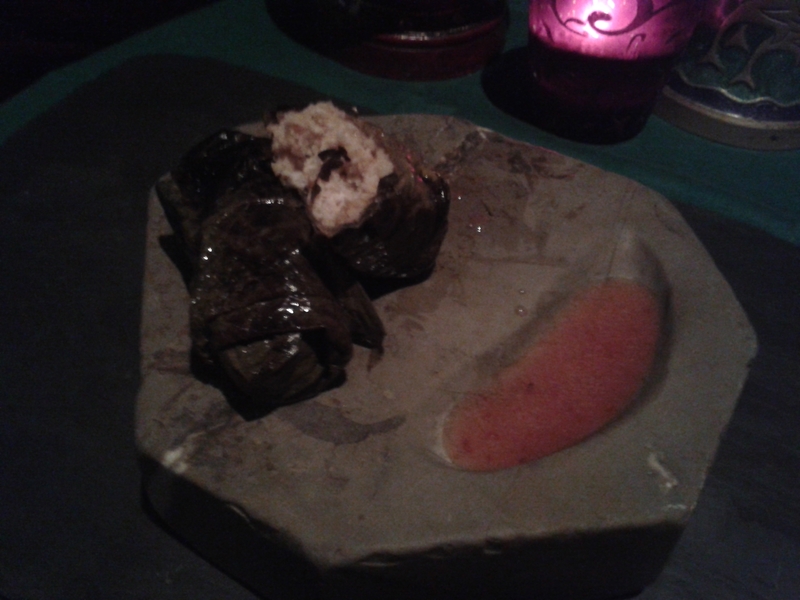 It came looking like the Greek Domades, which is rice wrapped in vine leaves. It had a smoky and almost cigar-type smell to it and together it tasted very much like kad kapraw gai which is a Thai minced chicken dish with basil and lemon grass. To be honest, because of all the strong flavours, I was unable to taste the actual crocodile, which was disappointing. It just had the texture of chicken. 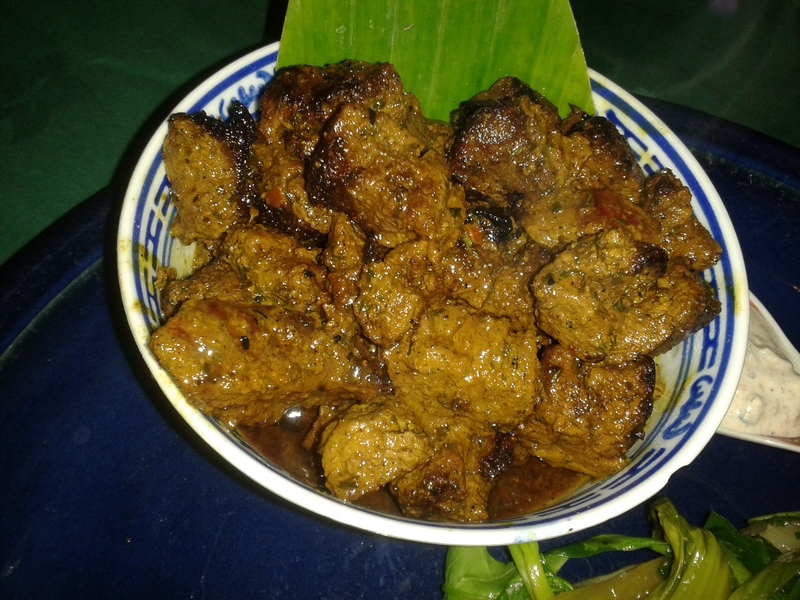 I ordered the kangaroo for my main, which tasted like Rendang (An Indonesian/Malaysian beef curry). It came as a very generous helping in a little Chinese bowl with a stir fry of Pak Choi and water spinach (which is known in Indonesia as Kang Kung) and a little Chinese soup spoon of Tzatziki-type sauce on the side. The flavours of the curry sauce, although absolutely delicious, definitely overpowered the meat and therefore it tasted very much like beef. Again, disappointingly, I couldn’t taste the actual kangaroo. Claire had the Bison, which came medium rare and had a side of watercrest salad, some cassava chips and a little Chinese soup spoon with a mushroom sauce. The bison had a mixture of interesting flavours to it. It had a liver-like taste and texture and the outside was very gamey and tasted slightly like fennel. 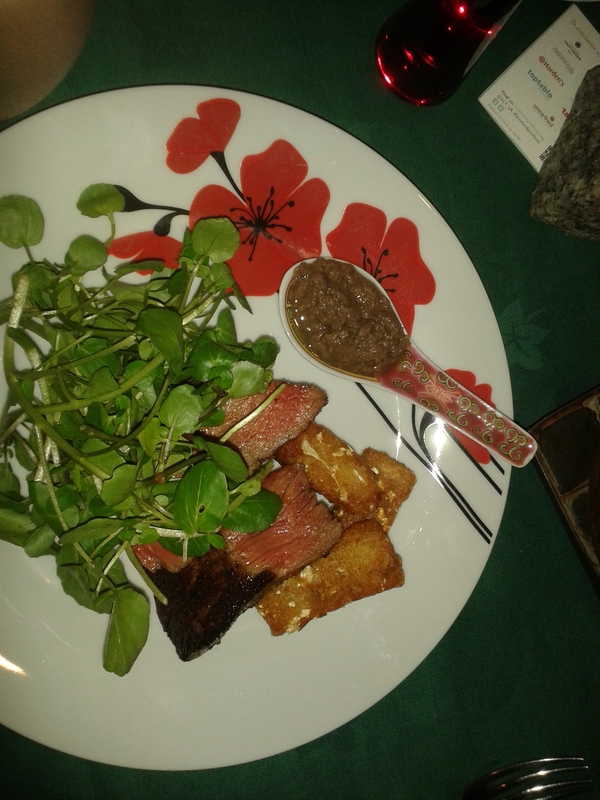 The cassava chips were very much like little hash browns and the mushroom sauce tasted slightly boozy and very earthy. Claire insisted that we order what was named on the menu as a Love Bug Salad, because if we were going to come to this restaurant to be adventurous, then we might as well do it right. 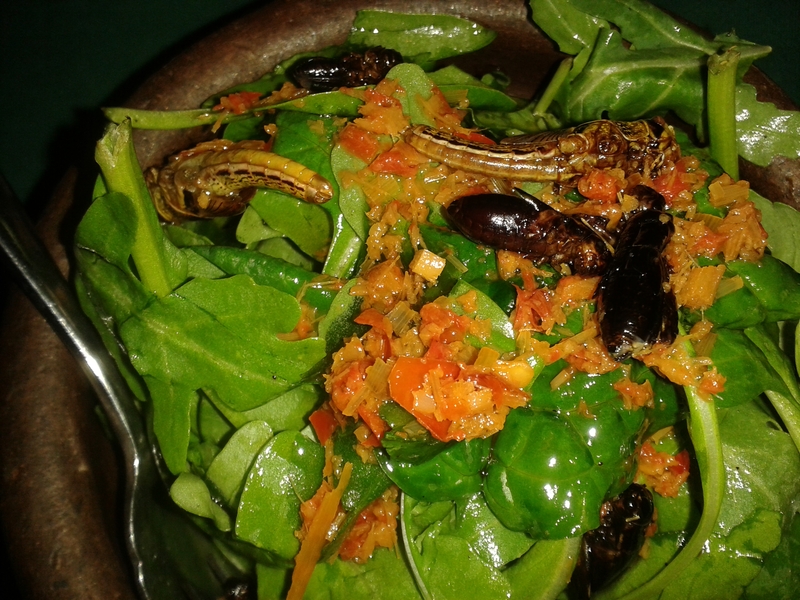 This salad was a mixture of rocket leaves, spinach leaves, a sweet and spicy dressing and (of course) the bugs, which were locusts and crickets (mmmm… Yummy… please sense the sarcasm). I am very adventurous when it comes to food, but not when it comes to bugs as I do have a HUGE fear of them. Claire put me to shame as she dug straight in a crunched a cricket without batting an eyelid. I must say, it took me a couple of tries to allow myself to put that fork with the toasted and seasoned cricket into my mouth and (don’t ask why) I had to chew it very fast with my eyes closed. After swallowing it, I realised it wasn’t that bad. It tasted like a tiny little piece of barbequed meat. 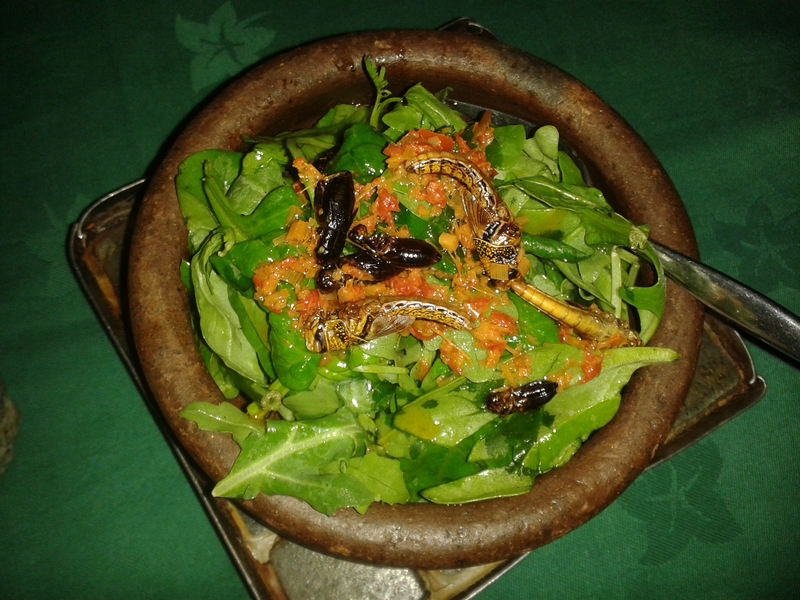 I could not bring myself to eat the locust, but Claire said it also tasted exactly the same. And now, Reader, I can only dare you to try it for yourself. And as the evening came to an end, our waiter brought out the dessert menu and casually noted, “We’re out scorpions and beetle, but we do have some crushed worms”. At first I thought he was joking so I laughed, but he kept a straight face and explained that this was definitely not a joke. “Oh good”, I thought, “Well, at least they have the crushed worms”. In the end we were too full to even think about ordering a dessert so we just got the bill, which ended up being £40.00 per person. I thought it was very overpriced for the quality of the dishes as they were not high end to say the least, but the bison and the bug salad were definitely interesting to try. 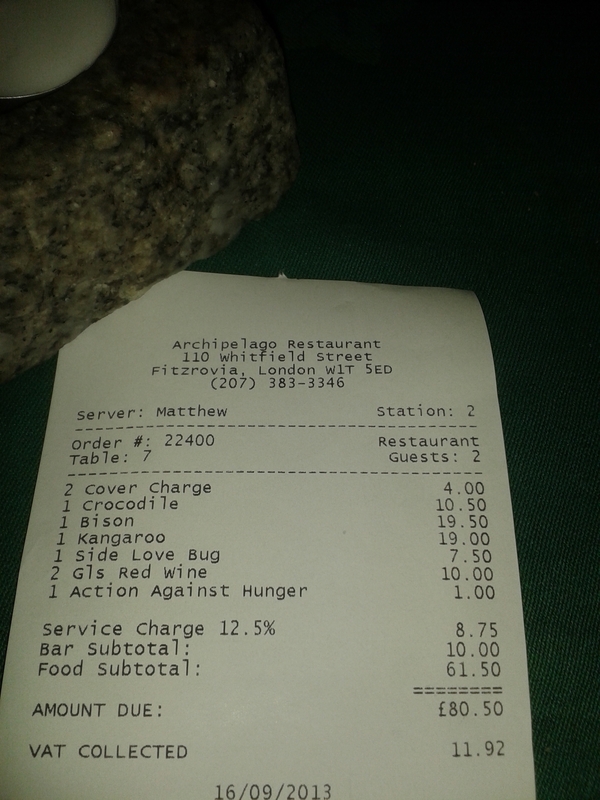 Also the atmosphere was very interesting and the service was excellent. 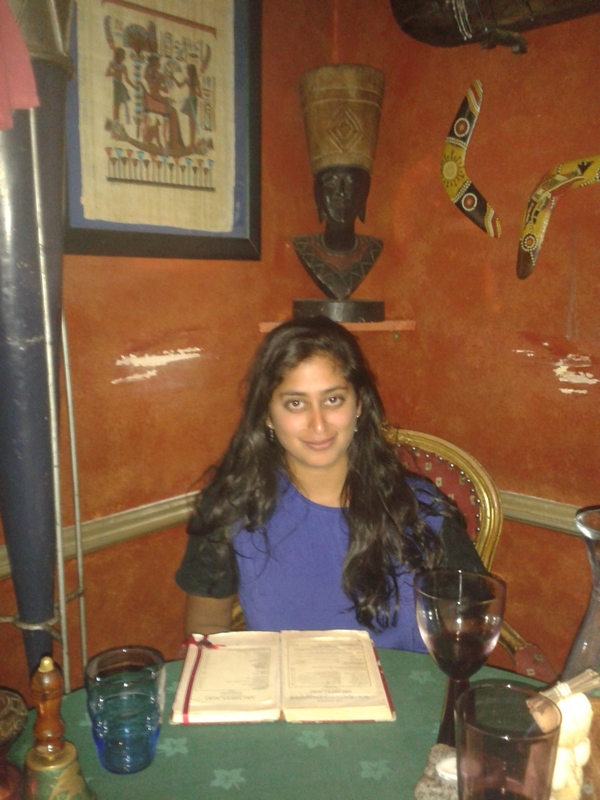 After a night out in a Shoreditch cocktail bar, Rebecca, Keya and I decided on a midnight feast before heading home. 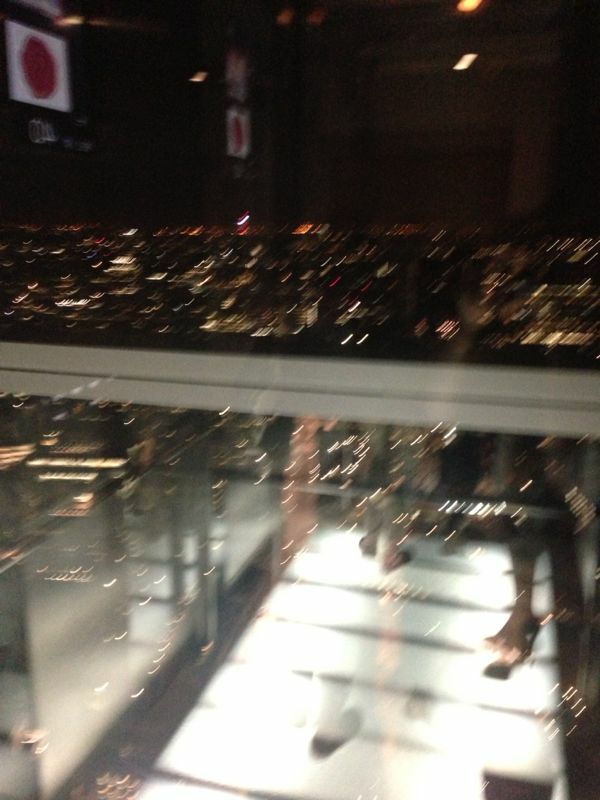 So, at 2am, up we went, in the famous glass lifts of the Heron Tower that lead up to the fabulous views of the City and, at the 40th floor, we casually strolled into Duck and Waffle. I had the perception that it would be bland and over-priced food (I was VERY wrong about both of these things), but the girls convinced me otherwise and we ordered a mixture of dishes to share between us so that we could have a taste of everything. Head Chef Daniel Doherty has created some stunning master pieces. He gives a delicious twist to classic dishes from around the world. 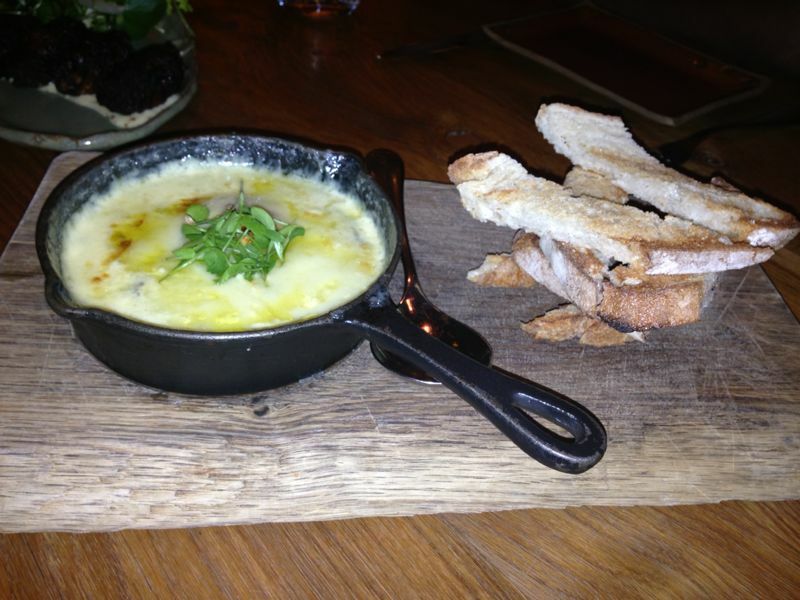 The Duck Egg En Cocotte (£12) was delicious (and this is not only because I have a huge love for cheese)! The stringy and strong flavoured Gruyere with the earthy flavours of the wild mushrooms and a duck egg all oven baked in a pan made for a fondue-type dish. It was served up with “crunchy soldiers” to scoop it all up. 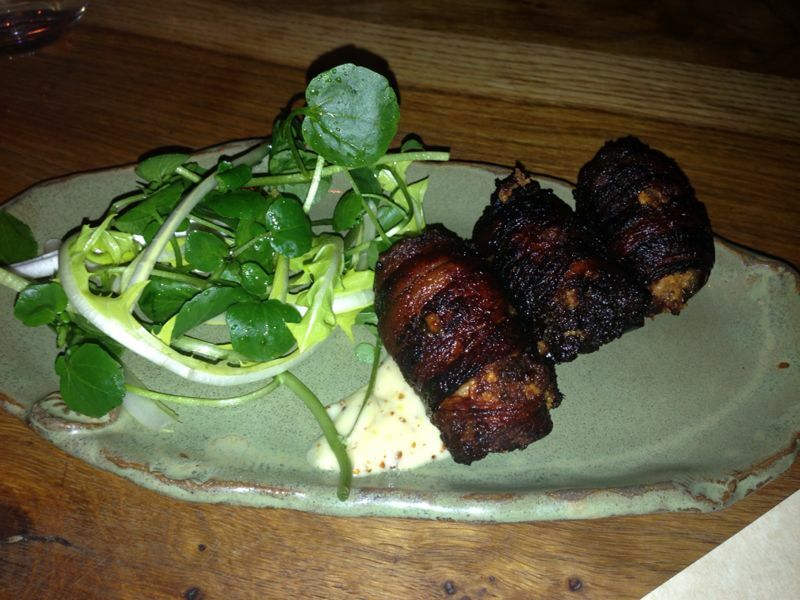 The Bacon Wrapped Dates (£9) were very interesting. I am not a huge date fan (in fact, I do not like them at all), however the salty, BBQ flavour of the bacon overpowering the sweetness of them made them taste divine! 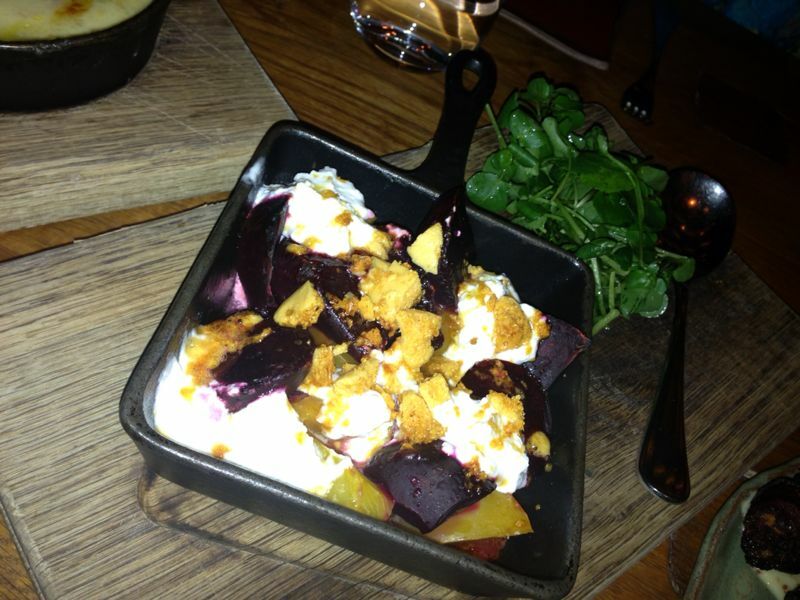 The Roasted Essex Beetroot (£9) had a light, refreshing and softly sweet flavour to it. It was definitely not as flavour intense as everything else but still a delicious combination that, again, would not usually be thought of. The goat curd in this dish had a very similar taste to cottage cheese and I feel as though it is what married the honey comb and beetroot together. Next, out came their signature dish – The Duck and Waffle (£17). It is a creative and absolutely delicious Asian twist to the Southern American fried chicken and waffle. 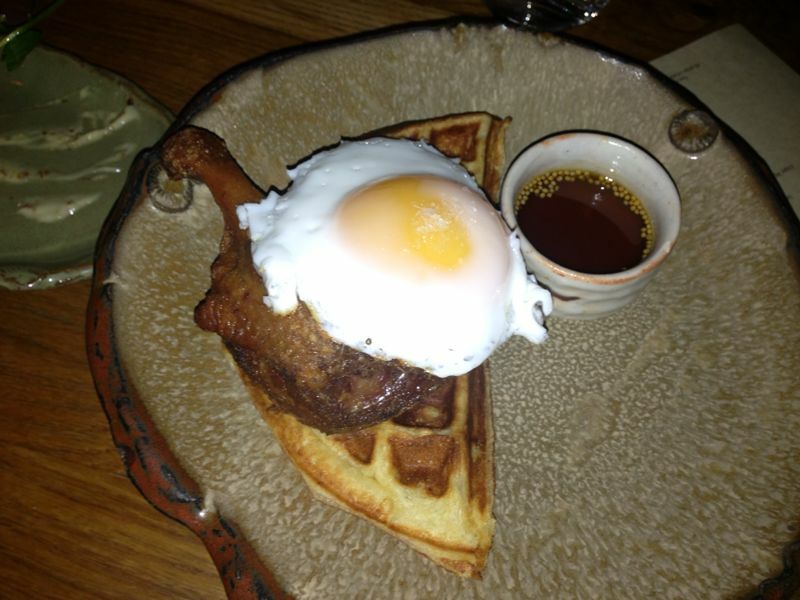 The duck was a crispy Peking duck style on top of a Belgian style waffle and a fried egg over it all. We drizzled the Maple Syrup over it and dug in. The flavours went surprisingly well together and I have definitely been converted! 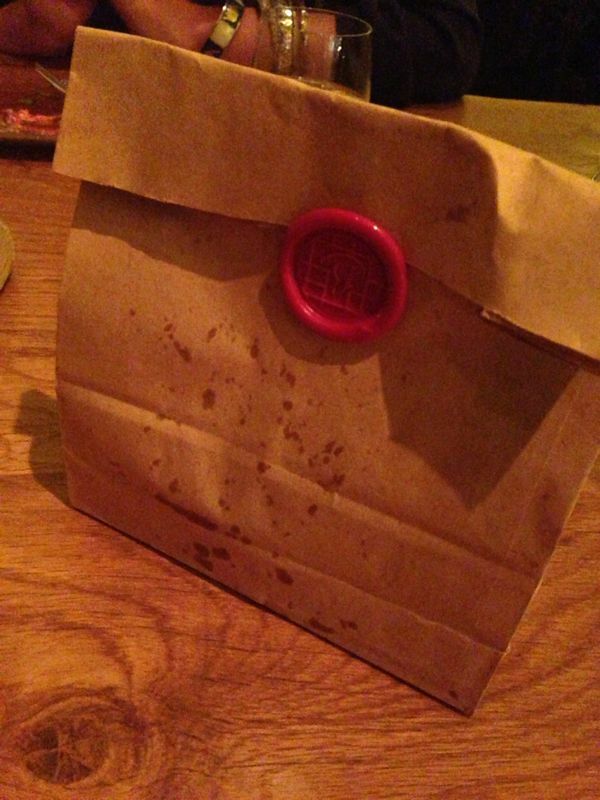 The BBQ Spiced Crispy Pig Ears (£5) came in a brown paper bag and were sealed with a Chinese red wax letter seal. 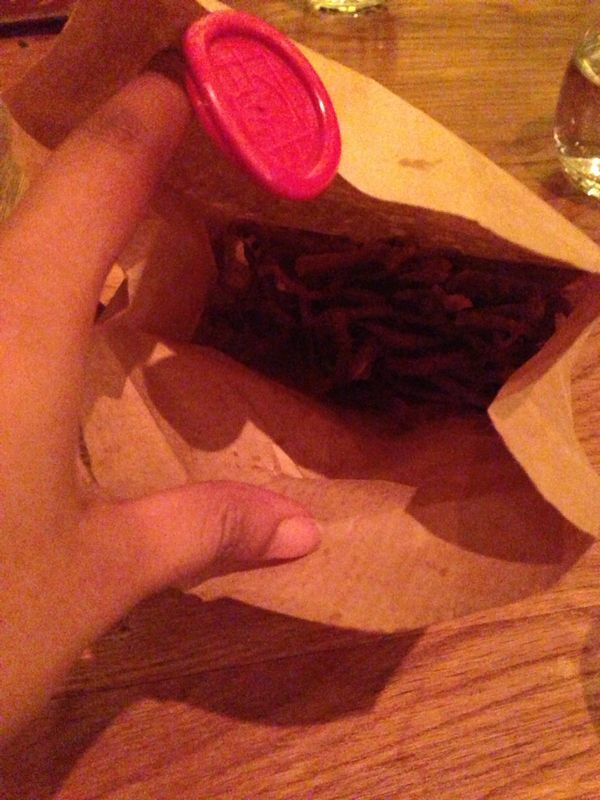 They were crunchy and tasted very much like pork scratchings. 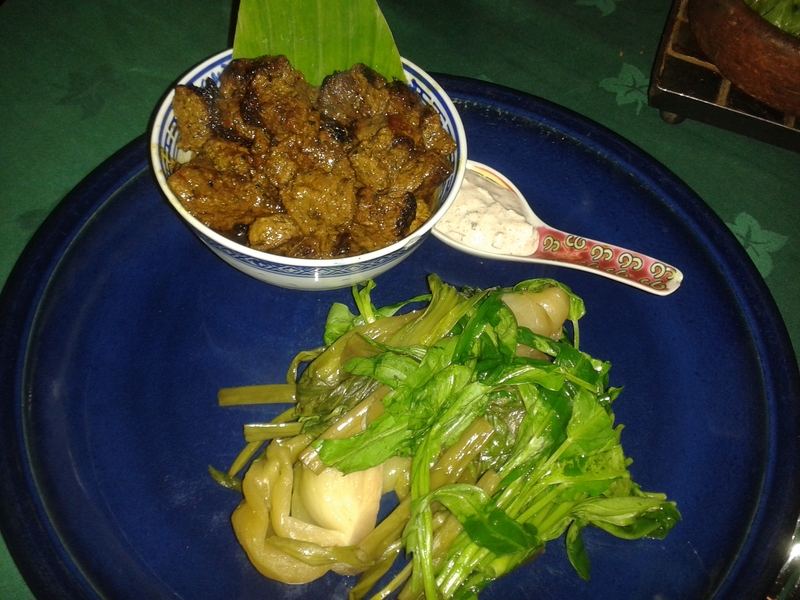 It was a Western twist to the Chinese sweet pork ears. A great ending to the meal as we munched on them like popcorn while we continued chatting away. It is a great atmosphere, great service, it is extremely well priced and delicious, interesting experimental food (which is making my mouth water again just thinking about it). 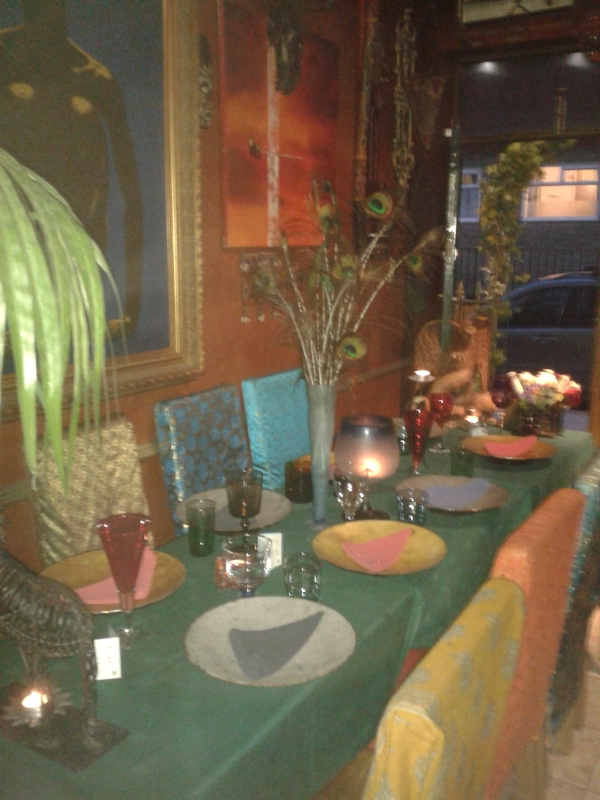 Perfect place for a midnight feast!